Alright! So the basic idea behind this game is to take turns telling a story with art. Someone will start by posting a drawing(s) of something with a short caption below. Then a new player will post up a drawing with another caption that will pick off where the first post left off in the story. The drawings can be as simplistic or complex as you feel up to making them to be! Feel free to add as many panels as you'd like to illustrate your part of the story, the only minimum is to have at least one panel and a caption. Rule one is to make sure you post beforehand that you want to make the next drawing for the story. This way we don't have two people posting different ways the story could go using the same previous image. Rule two is to make sure you post up your part of the story within 48 hours after claiming the spot. 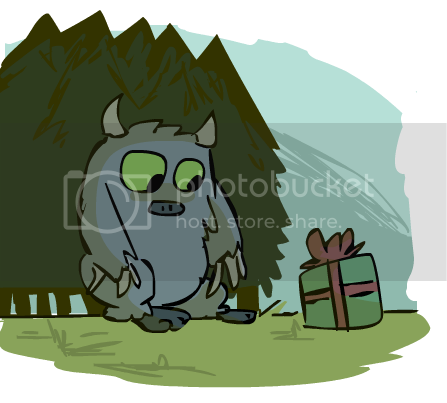 A monster standing at the edge of the forest finds a present and wonders who it's for. I'd like to give this a go. Should we perhaps have a time limit when reserving a post? Just to make sure somebody doesn't reserve and then disappear and kill the game, haha. Ah yes XD Should I add the same rule the 'Draw the Char' above game has? In which you have 48 hours to post up your part after claiming the spot before its free for someone else? The monster picks up the present and examines it. There is no tag. Overcome with curiosity, he carries it into the safety of the forest where he is sure no one is looking. 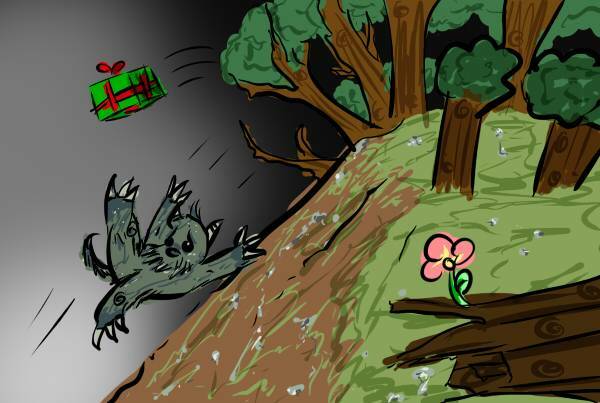 the monster was so excited to open the present that it accidentally tripped on a rock! and fell down a hill. he also noticed a nice flower on the bumpy way down. It brought him a moment of happiness. The monster found himself at the bottom of the hill with no way to climb back up, the flower waving resolutely in the wind and out of his reach. 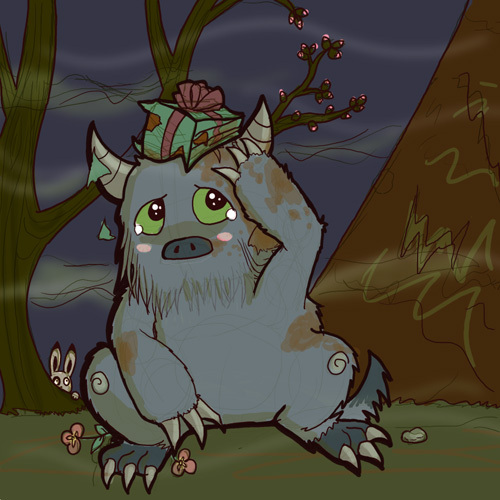 He was all alone, hurt from falling down the hill, and the present appeared broken. 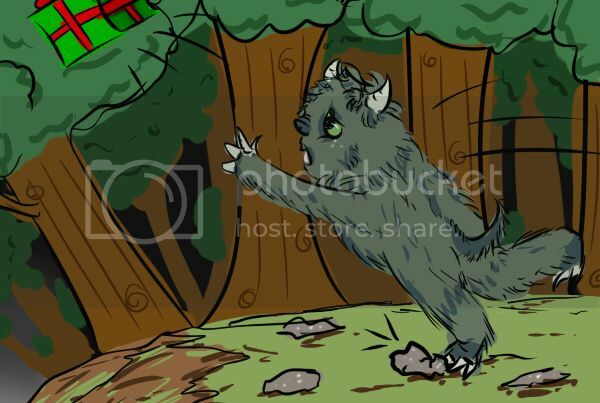 A kind hearted rabbit who had witness the whole thing came out from behind a tree to give the monster a "Get well" kiss.